Some things in life leave you wondering if it’s all worth it. Certainly that was the theme of this week’s episode of The Walking Dead. Life goes on, but at what point is it not really worth it? That’s what Rick (Andrew Lincoln) seemed to have on his mind as he sliced open the thighs of live pigs to lure walkers away from the prison. Not even bothering to wipe the blood from his face he wearily kept on, if only to preserve the safety of all who have come to depend on him. The sacrificing of the pigs symbolized the loss of the “normal” life they have been striving for. Well, most of them have been striving for at least. Prior to the pig sacrifice we see that things are on shaky ground. Starting right off we see a grisly scene where a good number of the prison refugees are wiped out after a sick boy turns and begins feasting. Such a scene might normally be the climax of an episode, but in this case it simply served as the setup for the grim reality they are all in. Setting up a farm or a school seems pointless when it can be wiped out in a matter of minutes. However, it is that semblance of the life they once had that’s kept them sane. What I find interesting is that there are some who thrive in this new world. Daryl (Norman Reedus) has become a better person and excels when he is survival mode. Likewise Carol (Melissa McBride) has gained self-confidence and a purpose to her life. Since the loss of her daughter, Carol has become determined to survive and to help others. It’s no coincidence she wants to help other children escape the fate of her daughter Sophia. She teaches them the skills to survive that she never taught her own daughter. However, while both of these characters thrive on surviving I don’t think either are the culprits who are trying to destroy the prison. As it turns out someone is luring walkers to the fence by feeding them dead rats. Is it someone who was sympathetic to the Governor? Is it someone with a death wish? I suspect it might be one of the children who still viewed the walkers as people. Maybe the child thought they were helping the walkers by feeding them. It’s hard to say, but it does show the fragility of the whole system they have set up. All of these ideas gave this episode an emotional impact. Yes, it is fun to have some exciting zombie encounters, but this show is about the human element and that was ever-present in this episode. I don’t want to fail to mention a couple of the more emotional moments in this episode. One was a heartbreaking moment when Michonne (Danai Gurira) cries as she holds baby Judith. We realize she must have had a family of her own at some point – it’s certainly been hinted at before, but this brought it to life. Another was when Tyreese (Chad L. Coleman) goes to visit his sick girlfriend only to find she has been brutally murdered. The most poignant moment came at the end when Rick gives Carl (Chandler Riggs) his gun back. 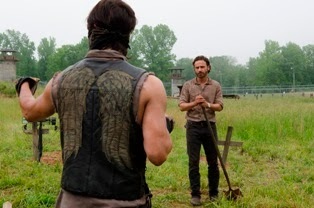 After Carl’s mishandling of a situation last season, Rick had forbidden him to handle weapons out of fear Carl was becoming too cold-hearted and forgetting his humanity. So why does Rick give Carl the gun back? Not because he is no longer worried about that, but because it’s the only way Carl will survive. Because Rick realizes Carl will never grow up to have a normal life, and that this new life is normal life.